Roxy Palace Casino has been in operation since 2000 and does not accept US Players. The casino has the “Play it Safe” approval from eCOGRA since 2004. The site has been licensed by the Gaming Authority of Malta. Its monthly pay out rates has been independently verified by eCOGRA and it delivers a steady payout rate that is above 96%. In 2007, their yearly average was 97%, which is excellent for any casino, online or land-based. Roxy Palace uses the Microgaming software which is a leader in online gaming software. It has an excellent system known as Play Check and Cash check that keeps track of you playing and payment history and can only be accessed when you are logged into the system. The software on the site can be down loaded or you can use the flash version to play games on any computer without the need to download. The site boasts of one of the largest selections of games. 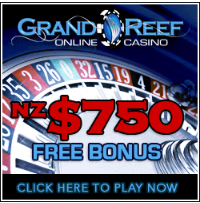 You have the choice of over 200 online casino games to choose from. Slot players never get bored with some of the largest progressive jackpots on the web and the site was recently voted Best Slots site on the Web. It hosts an online slots tournament guaranteeing $50,000 in wins every month. The site offers a welcome bonus of 100% Match Bonus up to $100 Free. It also offers Super Mid week Bonuses, which you find out about via email.